May brings renewal to the mountains and memories of the snowy winter past. At this time of year the high peaks still show patches of snow while the streams and rivers run fast bringing icy cold waters from high up on the Continental Divide into the headwaters of the famous Arkansas River which heads south to become the mighty Arkansas, offering some of the best rafting in the world. Our Rafting partners provide exciting combinations of their tours with our zip line; check our links page to see contact information and explore all the different options available. In early spring we usually use 4-wheel drive vans to get guests up the mountain to the first zip lining deck at 11,200’ of altitude. Herds of elk return to the property in spring after their winter vacation in southern Colorado. 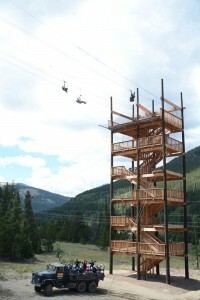 The Leadville Colorado & Southern Railroad starts operations at the end of May and we offer the Rails & Zip Line Combo with lunch after Memorial Day. WE ARE THE ONLY ZIP LINE TO FLY OVER A RUNNING TRAIN. As soon as trail conditions warrant, the Monster Truck go back to work, running back and forth from the check-in lodge up steep winding trail to our cozy Yurt where water, hot chocolate, snacks and other complimentary beverages are available. Dress warm for spring tours. Delicious lunches are provided for all combo tours. Experience warmer temperatures in July, August and September, but it is always cool and comfortable on our PRIVATE PRESERVE at altitudes from 10,000 to 12,800’. Our tour participants are the only folks who can access this vast back-country area. Learn about the mining history of the area from our knowledgeable guides; and see some of the 40 old gold mining claims from the era when Leadville was a boom town. Wild flowers are blooming late summer and into the fall; and when the color season arrives, see the splendor of the Rocky Mountains from a totally different view. In November we switch over to our winter SNOW CAT/ ZIP LINE TOURS and City of the Hill Restaurant in Leadville adds a delicious hot soup to our Combo with Lunch. Travel up the mountain in our comfortable Pisten Bully Snow Coach, then enjoy awesome views of Mount Massive and Mount Elbert, 2 of the ‘FOURTEENERS’, from the deck of the cozy Yurt. Choose a combination of snowmobiling and zip lining for the Ultimate Thrill. No matter what the season, we’ve got it covered. Come on up to the high country and share our beautiful world. Top of the Rockies is inspected yearly and is registered with the State of Colorado. We opened in 2012 and have a 100% record of safety. Double Overhead Cables on every Zip plus an automatic braking system will assure a fun and stress free experience no matter how young or old the participants. Weight restrictions apply.